This sure looks like a snow-covered road in a small British oceanside town, right? Yeah, it's not. No, what you see here is not snow, nor airport fire-extinguishing foam, nor the world's biggest shaving cream fight. 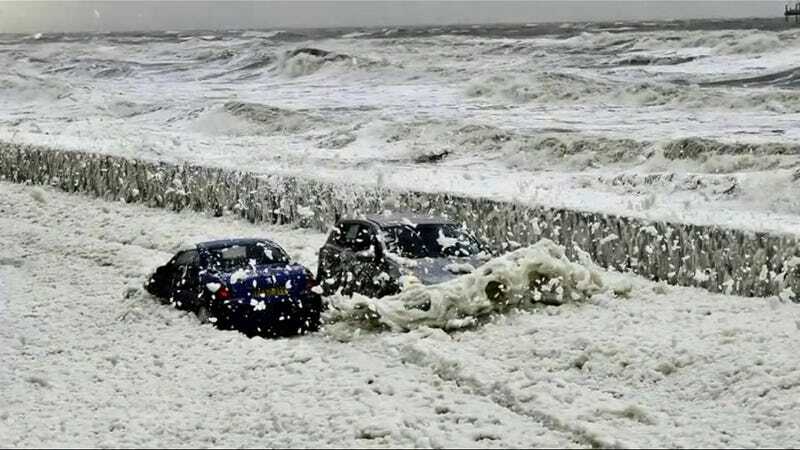 It's sea foam — lots and lots of sea foam — covering roads and traffic in the British town of Cleveleys. Northern Great Britain was hit by a fierce windstorm on Wednesday, with some gusts blowing at over 130 mph. The winds were strong enough to emulsify the Irish Sea along the Fylde Coast, turning the saltwater into sudsy globs that blew up onshore and coated everything in a knee-deep layer of white foam with the consistency of the head atop a fresh pint of Guinness. The foam is technically called "spume," and is made possible by decaying algae and other organic materials in the water acting like egg whites in this monstrous batch of whip that probably tastes a tiny bit like horrible Scotch from the Isle of Islay. You can almost hear the paint dissolving, layer by layer, in the salt-foam bath.